When I first heard that Lisa was missing, I pulled out this WIP and started stitching. It’s what I do to meditate…pray..send good vibes… whatever you want to call it, when a fellow designer is in need. I just don’t usually post about it because it’s my personal way of relating to the individual. I have a few stitched finishes around here that serve as memorials to their creator and sadly, this one will be joining them. There’s a group SAL in honor of Lisa on facebook, and Mariah has written a blog post about her mother if you’d care to leave a comment there. I was planning to write more here, but when it comes right down to it… I don’t think I can. 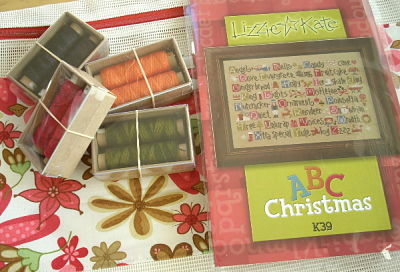 The online needlework show starts this afternoon, and I will have a page again. This show is neat because even though retailers are the only ones who can place orders, everyone gets to have a look at the consumer viewing pages. I usually sit down with a pot of coffee and go through it all once, making notes of what I like, and then go through again a few days later to finalize my shopping list. There are doorprize offerings scattered throughout as well; My Mark is playing along… I’ll be posting the winners here on my blog. I have found a few more designers keeping blogs! 1. two pair blue scissors from Dinky Dyes, white Little Gems and a bee skep Needle Minder from Kelmscott, floss skeins from Threadworx, and a snazzy leaf tape measure from Lantern Moon. 2. One of those big project bags from Stitch A Gift, LK Christmas ABC’s, and something new from Weeks Dye Works: two-stranded floss on a little roll… how cool are these be for motif or monochrome samplers?! Miranda told me that she just started with a few colors, but plans to expand the line. 3. “Quaker Diamonds” by Rosewood Manor. I collect Karen’s charts because they’re pretty… I’ll probably never stitch one. 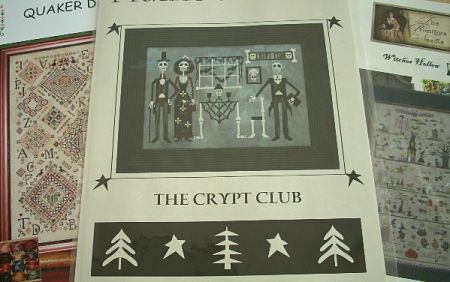 “The Crypt Club” is a fun design by Prairie Moon. The model for the next in the series was on display, too… I have a feeling this skeleton couple is going to have lots of fun over the next year. Now, I’m not usually interested much in witchy things, but Lisa’s “Witches Hollow” is very clever… I wish you could have seen this model! If you know of others, please let me know… I’ll keep editing this post as needed, and put it on a tabbed page when I’m back from vacation. Edited: Yeeks! Several of my links were all wonky… fixed now, I think. Sorry!